For whatever reason, Molly and I have a special connection. She makes me smile even when she makes me furious, and she flops around like a clumsy puppy. She's my bearded-lady. Molly has always been kind of the outcast. She loves the other dogs and they love her, but she is typically the one who gets picked on. She also has doggy anxiety, and she is extremely clumsy. If there is a way to get hurt, the poor girl will probably find it. We try our best to prevent all these things, but often-times, she brings it upon herself. 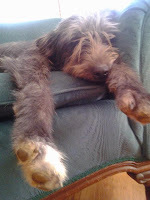 She will annoy the other dogs to no-end, which brings on the bullying. But the thing that I admire about Molly is, even with all these problems: a skin disease, constant self-inflicted accidents, and pooch anxiety, Molly still is a very happy girl. It's really unbelievable. She is not dumb, but even when she has just been punished for misbehaving, or when she's been nipped on the nose by Bella, her tail is still wagging. One time, Freckles got caught in Molly's collar, got scared, and punctured a hole in Molly's neck (see what I mean about accident prone? )....as soon as we freed Freckles from Molly's collar, Molly was already happy again. She wasn't wag-her-tail-and-lick-everyone happy, but she was calm and fine. Freckles could have unintentionally choked Molly to death during this fiasco had Taylor and I not been home, but Molly was barely phased. We walked inside, cleaned her up, and she was back to her happy, tail-wagging self in a matter of minutes. Most of us live very blessed lives. There is no reason we can't find joy and happiness in each day. Maybe I won't wag my tail (because that would be awkward), but I can be cheerful, joyful, and content. I can encourage others, even when things don't go my way. Me getting hurt, feeling sick, or being treated poorly by others should not drastically affect my mood. Because of Jesus, I am blessed beyond measure (Eph. 1:3-14). And even on a smaller scale, he has also blessed me with a great husband, family and friends. I have food to eat, a roof over my head, and I even get to have some things I don't need but just enjoy, like candles, books, coffee, etc. Maybe you don't feel like you are blessed. Maybe you feel like you are less blessed than those around you. Even so, there is always something to be thankful for, and there is always a reason to be happy. If you are breathing, you are blessed. Life is a gift and we can chose our attitudes and actions. 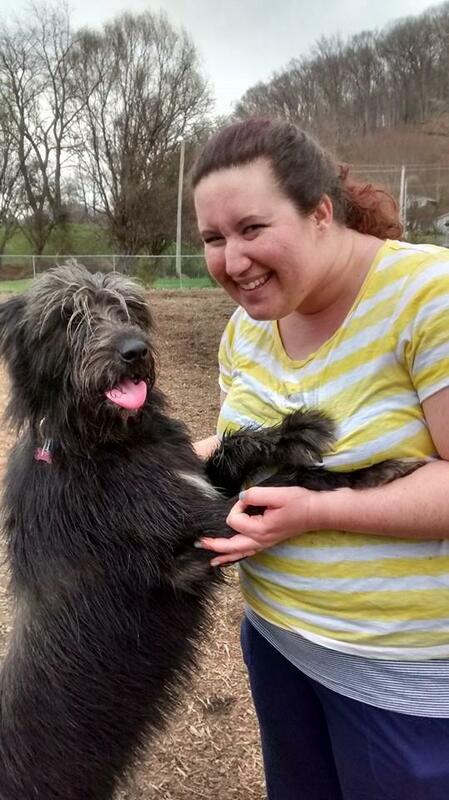 We can chose to be joyful regardless of circumstances, just like Molly. And that is what I have learned from my dog. Thank you for stopping by and commenting. I'm on Bloglovin, if you want to follow me. This is so sweet, Kristin! 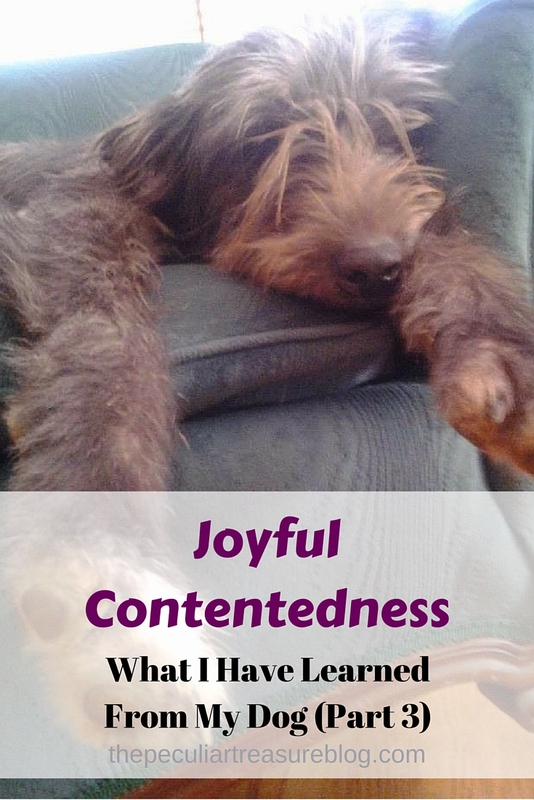 I love the concept of joyful contentedness - we could all use a little more of that in our lives! Thank you, Emma! I appreciate that! i swear this is true about dogs! we can learn so much from them. i've learned a lot from my dog, Charlie! Yes! I am glad you can relate! My Miranda cannot stand to see me cry. She gets really worried and starts giving me kisses and trying to figure out how to make me smile. My husband swears she can sense that I'm crying even when she's outside. She mostly ends up snuggling with me until I smile. So sweet! I love how dogs can be so intuitive! Aww! Thank you, Trish! I really appreciate that a lot. Dogs make every day better, even when they drive me crazy. So sweet!! I have two fur babies and they teach me so much every day. They are completely silly and sometimes a mess but I would not trade them for the world. Exactly! Thank you for reading, Mistle! They really do! Our home would be a lot less eventful (in both good and bad ways) if we didn't have our dogs. I wouldn't trade them in though! They are awesome! So many wonderful lessons we can learn from our furbabies! Thanks for sharing!